Wellington, FL (August 2, 2010) – Five may be dressage rider Caroline Roffman’s favorite number right now, as the talented 21-year-old rode her Hanoverian gelding Bon Chance (Belissimo M x Wintersong by Weltmeyer bred in Germany by Marefield Meadows) to the Five-Year-Old Championship at the Markel/USEF National Young Horse Championship in Lamplight. It was the first national championship for Roffman, who lives in Wellington, Florida, and trained Bon Chance herself. The Five-Year-Old victory was the fifth win at a major show for Bon Chance, giving the duo a five for five record. Bon Chance also won the Five-Year-Old Preliminary Class at the Young Horse Championships, captured first at the 2010 Dressage at Equestrian Estates as well as the 2010 Dressage Derby and was Reserve Champion at the 2009 Young Horse Championships in the Four-Year-Old class. Pratoni del Vivaro (ITA), 1 August 2010 – After a nerve-wracking obstacle driving competition at the FEI World Single Driving Championships in Pratoni del Vivaro, Italy, Germany took home both individual and team gold. Thorsten Zarembowicz is the new World Champion. Poland’s Bartolomiej Kwiatek took the silver and Italy’s Cristiano Cividini won the bronze medal. World Championship course designer Christian Iseli is known for his challenging obstacle driving courses, and at Pratoni he built another selective course, sticking to his motto ‘Not easy, but Iseli!’ The course, which was underestimated by most of the drivers, consisted of many sharp turns and the tight time frame made it difficult, but nevertheless do-able. HICKSTEAD, England, Aug. 1 — Adelinde Cornelissen and Jerich Parzival dominated the final Exquis World Dressage Masters of the year with a resounding victory in the Grand Prix Freestyle Sunday with Dutch team mate Hans Peter Minderhoud on Exquis Nadine was runner-up. Adelinde and the 13-year-old chestnut gelding ranked No.2 in the world, received a score of 85.650 per cent with Hans Peter and the mare receiving marks of 78.850 percent in the €60,000 (US$78,000) freestyle. Great Britain’s Laura Bechtolsheimer and Andretti, who had finished second behind Adelinde in the Grand Prix, was third on 78.250 per cent. Adelinde and Parzival had won the Grand Prix with a score of 81.362 per cent, a margin of eight percentage points over the second placed pair. Great Britain’s Carl Hester, in the first CDI5* since getting the ride back on Liebling II, won the €30,000 (US$39,000) Moorlands Grand Prix Special earlier Sunday, and most likely secured a place on Great Britain’s team for the World Equestrian Games in Kentucky next month. Lexington, KY – August 1, 2010 – The curtain closed on the Kentucky Summer Horse Show, the first in the summer series, and the last event of the week did not disappoint. The week featured classes such as the NAJYRC finals and the $30,000 Hagyard Lexington Classic, and the most prize money was offered in this evening’s $40,000 Kentucky Summer Grand Prix, sponsored by Audi of Lexington. As the sun set over the Kentucky Horse Park’s Main Outdoor Stadium it was 20-year-old Hungarian Henri Kovacs garnering the win with Plain Bay Farm’s Sassicaia II in their third Grand Prix victory as a team here in Lexington. Thirty-two entries competed over today’s 13-obstacle, 1.50 m course, designed by Olaf Petersen, Jr. The technically demanding track included a wall fence, triple bar, a double combination and a triple combination. The distances in the related lines required control of the mount, and a tight time allowed required a precise route to break the beam within the 80-second time allowed, which already had been lengthened from the original 72 second limit. HICKSTEAD, England, July 31 — Adelinde Cornelissen rode Jerich Parzival to victory at the Exquis World Dressage Masters Saturday with their best ever Grand Prix score of 81.362 per cent while Laura Bechtolsheimer and Andretti turned in their best ever result of 73.362 per cent for runner-up and home side joy. Hans Peter Minderhoud and Exquis Nadine, selected to be on the Dutch team with Adelinde at the World Equestrian Games in Kentucky in September, finished third with 70.936 per cent. The €10,000 (£8,320/US$13,000) Grand Prix kicked off the fifth and final CDI5* event for 2010, the second year of the richest lineup of dressage competitions that started with Palm Beach, USA, then moved to Munich, Germany, Cannes, France and Falsterbo, Sweden for the first time. Each of the events carries total prize money of €100,000 (£83,200/US$130,000). Andres Rodriguez and Pablo Barrios (left, center) in the medal ceremony. All Photos © Anwar Esquivel. Mayaguez, Puerto Rico – July 31, 2010 – Pablo Barrios represented his home country of Venezuela well this week at the 21st Central American and Caribbean Games in Mayaguez, Puerto Rico. Barrios rode G&C Quick Star 11 to the gold medal in the first individual round, helped the Venezuelan team win the gold medal, and finished as the overall individual gold medal winner. G&C Quick Star 11 is owned by G&C Farm. G&C Farm, owned by Gustavo and Carolina Mirabal of Venezuela, is based in Wellington, FL. Barrios is also based in Wellington, FL. In the opening speed round, Barrios and G&C Quick Star 11, a 12-year-old KWPN mare by Quick Star x Grannus, were the fastest clear round to take home the first gold medal in show jumping. Venezuelan teammate Andres Rodriguez won the silver, which helped Venezuela take the lead in the team classification going into the next day’s Nations Cup competition. 31 July 2010 – Perfect conditions created a wonderful environment for the marathon of the FEI World Single Driving Championship in Pratoni del Vivaro, Italy. Undulating tracks on a green meadow and the obstacle site nicely embedded in the hilly landscape ensured great sport. The eight obstacles built by Austria’s course designer Christian Iseli offered the competitors countless route options. Two of them included extra large water elements, built and flagged in a modern and horse friendly way. Before the start of the World Championship, the possible hot weather conditions in the summer in Italy was much talked about, but it could not have been better today. Twenty-seven degrees Celsius was the highest temperature reached. The marathon was heavy, but fair and selective, absolutely ideal for World Championship competition. July 31, 2010 – CHICAGO, (EWA) – The National Conference of State Legislators (NCSL) has passed a resolution calling for the reinstatement of USDA inspectors for horse meat. The NCSL is a non-governmental lobbyist organization which serves the nation’s 50 states legislators to advocate and lobby for the interests of states before Congress and federal agencies. The resolutions NCSL passes are not binding and merely allow them to lobby on behalf of the states. The Equine Welfare Alliance (EWA) strongly opposes the misuse of tax payer dollars to fund inspections for an industry that is not needed or wanted by the overwhelming majority of Americans. 31 July 2010 – Germany’s Thorsten Zarembowicz has set a new standard in the Single Horse Driving scene by putting down a wonderful score of 35,20 penalty points and taking the lead at the FEI World Single Driving Championships in Pratoni del Vivaro, Italy. The German Team is leading the Nations Cup after the first phase of the combined driving competition. After two days of dressage in which the best 72 Single Horse drivers in the world showed their skills, Thorsten Zarembowicz is the new man to beat in dressage. Zarembowicz bettered the score of the title defender Jan van den Broek from the Netherlands by over six penalty points. 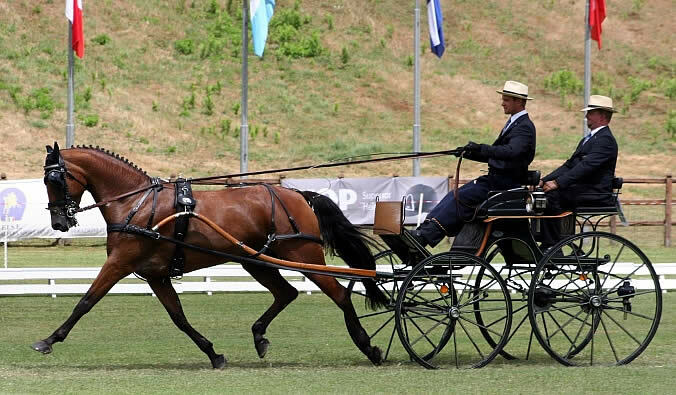 The 31-year-old manager of the driving stable of former World Champion Michael Freund drove a wonderful test with the 8-year-old Holsteiner mare Sunrise. His test thrilled both the spectators and the judges. After the Finish Line presents their Annual Charity Fundraiser, “A Tribute to the Majesty of Thoroughbreds,” on Thursday, August 5th at the Hilton Hotel in Del Mar, CA. We will host a reception, silent & live auctions and dinner. ATFL is a funding non-profit dedicated to saving, rehabilitating and caring for rescued Thoroughbred horses who can no longer race or breed. For ticket information please contact Dawn Mellen at dawn@afterthefinishline.org or (858) 945-1371. Please consider a donation if you cannot attend. Our auctioneer is Hall of Fame trainer Jack Van Berg. Our guest speaker is Katherine Brooks, the writer/director of The Boys Club, www.theboysclubmovie.com. We will also show a heart warming video about a rescued Thoroughbred ex-racehorse. Please forward this message to your equine friends and those concerned with the welfare of animals. It will be a FUN evening supporting a worthy cause! Disregard the RSVP date on the invitation. A late fee will not be charged. If you can attend, please print the invitation and return it with your payment. We also accept PayPal through our website, www.afterthefinishline.org.